First Community Grant Program Success! The first installment of the Chicago Community Grant Program was a major success in all respects. The program was far more successful in its first iteration than was supposed, and there is positive momentum looking forward with the project. Two months before the dinner salon, announcements were made on the local lists and social media pages announcing the creation of the program. We received several e-mails from community members stating their interest in applying for the program, though many of these inquiries stated that the deadline’s proximity to the Lakes Of Fire event was a barrier. In the future we seek to keep the grant salons in both May & November. That, we believe, will not cause the same time constraints, and will help fill some of the slower months in the community calendar. One month before the dinner salon, applications were due. We used a GoogleDoc form for applications, but also allowed applicants to submit a word document, though no one chose this option. We received 8 project applications — surprisingly none from those who had inquired earlier in the process, and no applications from ‘core’ community members. Most of our applicants had little knowledge of the ‘Burning Man Chicago’ community, which was exciting. We made a call out for judges to review the applications. We attempted to acquire one judge from the SteeringMan committee, two judges from the local BwB-Chicago group, and one guest judge. Using this model we made call-outs for interest in judges and Philamonjaro, Devin Breen, Dan Simborg, and Maggie Sather all stepped forward. This selection committee met to discuss the applications 10 days before the salon. Everyone had a chance to review the applications online before meeting. Our selection criteria included: missions/goals aligning with ours; project feasibility; utilization of the 10 Burning Man principles; impact the grant money would make on the project; interactivity/participatory nature of the project, engaging the community; and volunteer opportunities available. While all the projects had merit, some certainly met the criteria more than others. The four judges rather readily agreed upon the four projects that would be presented at the salon. In the future, it would be helpful for the selection committee to meet closer to the application deadline, to allow the candidates more time to prepare their presentations. The four projects selected were diverse, and show the range of interest and topics that can be considered within a civic grant program. The chosen projects covered the topics of: Bikes, local food, the mentally challenged community, and homeless teens. The night of the dinner salon was electric. More people than we ever expected showed up. A half-hour before the event had even started it was clear that the program had already outgrown ECO as its space. TransAmeoba has already been confirmed as the next location for the November grant cycle. Our counter at the door was for 82 people — though that does not account for everyone, and several community members with knowledge of the space were able to enter the back door. A majority of the audience would not be what is considered ‘core community members’. We charged an entry fee of $5 per head for entry into the salon. All presenters were given free entry as well as a plus one. Some projects brought in more people, which were let in for free; in the future we will better communicate the cost and how the free entry works. The presentations were all slated for 10 minutes. Breedlove kept time, though, not having set up any sort of system to let the presenters know when their time was up, two of the projects went over. In the future, a system of communication between timer and presenter will be established, and keeping presentations to 10 minutes will be more strictly enforced. All presenters made use of the projector system, and did a wonderful job of presenting. In the future, we may give a few suggestions as to what to include within the presentation since not all presenters gave the same amount of information. There was 5 minutes for Questions & Answers after each presentation, and all of the questions were pleasantly articulate and to the point. Questions focused on where the money was being allocated, possibilities of other sources for resources and management questions. The entire course of the evening was placed live on the Internet through Ustream. This was not an option that was popular, at most there was only ever 2 viewers- but we will continue this process to provide another means of involvement, and to also allow complete transparency of the entire event. After the presentations everyone was invited upstairs to the garden. In the garden work room, each person was given a voting form. They were asked to rate their favorite projects from 1-4, and place their vote in the voting box. Everyone was allowed one vote. After voting, everyone was invited out onto the roof to get dinner. Food was lovingly prepared by Edible Alchemy, and the attendees were pleased to get a taste of such delicious locally grown food. Desserts were donated by Trader Joe’s and Pierre’s Bakery. Dinner was lovely, there was plenty of food, and everyone was able to enjoy the lightning storm that was still in the distance. One hour after voting was opened we closed the voting box. The votes were counted using an instant-runoff system. First, everyone’s #1 votes were tallied. As neither of the four candidates received over 50% of #1 votes, the candidate with the least votes was eliminated. All ballots which indicated the eliminated candidate as their #1 vote now had their #2 vote count. The process continued, eliminating the lowest candidate until one candidate received a clear majority vote. This system was used so that everyone’s vote would count, there would be no spoiler effect, and the true favorite candidate would win. The money collected at the door was also totaled. The grant provided by BURN was for $500, and the $5 entry fee was an attempt at crowd sourcing the rest of the funds. The reason crowdsourcing is an important part of the process is to give each participant a stake in the program, and hopefully encourage an extra level of participation. $271 was collected at the door, which means that 54 people paid. In the future we will keep a closer count on the door, as there was a possible extra $100 that could have been collected. At the end of the day a grant for $771 was given out. After the votes were counted, it was clear that the winner was ‘One Voice, One Soul,’ the art for homeless teens initiative. As dinner was wrapping up, the storm clouds passed over, and quite conveniently, brought everyone inside and downstairs again. The winner was announced, merriment was had, Burners Without Borders offered the non-winning projects help in non-financial ways. The winning project representative sat down with Monica Storch and Flip-it and the payment of monies was explained. The $271 was handed out in cash, and the rest of the money will be paid out by check, as receipts come in for the payments. The expectation of follow-ups and timelines were explained to the project leads. The comments from participants were highly positive. We overheard many people exclaiming how excited they were to have participated, how interesting and diverse all the projects were, and how interesting it was to hear about these grassroots and youth-driven initiatives. One attendee stated that this was the most important event he had ever attended. As the evening wrapped to a close, the participants were extremely helpful in cleaning up and tidying the space. The housemates were extremely pleased with the help, and were excited that an entirely new group of people were exposed to ECO. The energy in the house was excellent, and the evening closed nicely with a rain storm. There is $500 left in the bank from the original allotment from BURN, which will allow this program to run in the same fashion in November. This entry was posted in Blog on September 20, 2012 by chopper. Announcing the Chicago Community Grant Program! Do you have a brilliant idea? Are you passionate about building community and giving back? Is being conscious of your environment important to you? We’ve got some exciting news to announce out to the community. The Bold Urban Renaissance Network (BURN) in collaboration with Burners Without Borders Chicago (BWB-CHI) is establishing a new granting program that is available now! How the Chicago Community Grant Program differs is that it will support community, civic-minded and direct action oriented projects. Ideally projects that tackle existing problems by connecting residents, creating collaborations, and utilizing the Burning Man Ten Principles. This will engage grassroots projects being run in Chicago, by Chicagoans. Micro-grants can be used for sustainable projects such as neighborhood cleanups, buying supplies to create a mural in the community, helping to fund a community kitchen, and much more! To learn more and get started, check out the full write up. Projects must be based in Chicago. Individuals, neighborhood groups, organizations, grass root projects located in Chicago may apply This includes- but is not limited to- block clubs, art groups, service organizations, citizen parks and recreational organizations, nonprofits, and individuals. An applicant may request up to $1,000. The program will be competitive and awards may be less than $1,000 depending on the project. Interested participants will need to submit their project proposals by June 15th. The submission form will be released to the public in two weeks. All projects will be reviewed by the Micro-grant Committee – consisting of two members of Burners Without Borders, one member of Bold Urban Renaissance Network, NFP and one guest judge. Projects will be presented at a salon-style gathering. Entrance to the salon will be $5, dinner will be provided. During the salon, four projects will present their ideas to the group. Applicants must be present to pitch their ideas. After the presentations, dinner is served and the voting begins. Each member at the dinner will be able to cast one vote. The projects with the most votes will receive a portion of the available money. 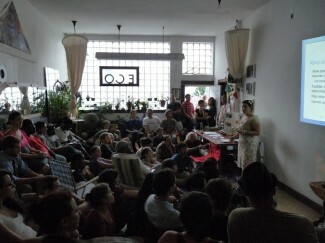 The salon will be hosted in Pilsen on July 15th. Mark your calendars now! So excited to see this program to come to life! Can’t wait to create with you! This entry was posted in Blog on May 7, 2012 by chopper.